So those who have been following the first 2 days…i Have been trying to develop a basic social networking site for Lead India 2020. 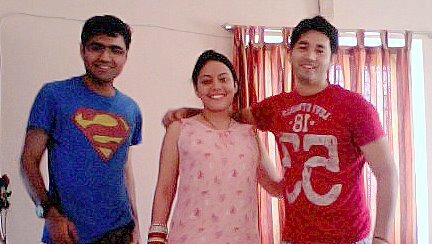 But it was a fun day,finally met Yamini and rohit . Its ben a long due meeting,have known her for 5 years now.Planned to spend the night at their place in Hyderabad. Watched the movie called “You dont mess with Zohan”. This is a must watch,this guy is like Rajnikant :P….fight scenes are out of this world. Yamini ,Rohit you are a good Hosts :)…had a wonderful time ,and yes Yamini you can cook :P…..
On a side note,hyderabad heat is killing,worst part is i am roaming on a bike that too at 1:00 PM…how bad can it get .